By D Home | 10 years ago We remain as superficial as ever. Forget what your mother told you about beauty on the inside. For our needs, it’s what on the outside that counts. 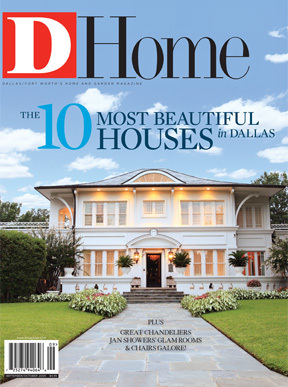 By Mary Candace Evans | 10 years ago These guys are saving mid-century Dallas ranches—one house at a time. By Brittan Dunham | 10 years ago As part of his commitment to reduce his carbon footprint, the Pyramid Restaurant chef grows herbs and produce atop The Fairmont Dallas. By D Magazine | 10 years ago In the 17 years that Lori and Rick Golman have lived in their North Dallas ranch-style house, only the address has remained the same. By D Magazine | 10 years ago Neal Stewart and Alan Carrell have relocated more than 12 times in the last eight years. And there’s no sign that they’re done with change-of-address cards. By Christine Allison | 10 years ago My house may be kindling, but for the moment, I’m sticking to it. By Rhonda Reinhart | 10 years ago B&B Italia gets a bigger, better showroom. By Peggy Levinson | 10 years ago The noted Dallas designer enters the literary world with Glamorous Rooms. By D Magazine | 10 years ago Prepare for a mood swing with these exciting elements. By Kellyn Curtis | 10 years ago Poggenpohl gets cooking in the Design District. By Mary Candace Evans | 10 years ago Feeling flush? Here’s the cool commode you need now. By Karl La Fong | 10 years ago A blast from my past—divorce court, actually—became my new neighbor.